Mic problem on Nokia C2-01 usually caused by several reasons, damage to the mic itself and broken line in the microphone circuit. 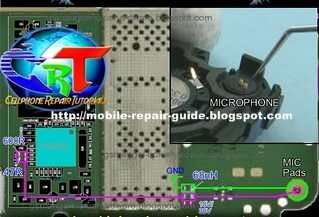 Here, mobile repair guide provide a picture relating to the Nokia C2-01 mic problem, the picture show you the mic circuit to be checked, if broken, just re-connect it using a thin wire (jumper technique). With the help of this picture, you don't need to read the Nokia C2-01 schematic diagram anymore :).